Having a smartphone with a decent camera has increased the frequency of pictures we KaZoos take, but not necessarily the quality. Unfortunately, time and other, more pressing issues, usually rob us of time to break out our old film cameras for photography. We also never, and I really mean never, print the pics we do take, which is why our frames have nine year old wedding pictures in them. And pictures of our cats. Confessions of the childless. We are in the process of trying to remedy that situation, and last summer I bought some 12 x 12 square frames from Michaels at one of their BOGo sales (plus coupon!) to use to create a gallery wall in our house for all the new, fun photos we would be taking of our new life at the beach. Flash forward a year, and those frames have languished in our foyer, empty…until now. After painting the living/family room, and rearranging the furniture, I knew I wanted to have a gallery wall around the TV. Since we only have one main living area in the ‘Zoo, and a small one at that, there is only one room for communal TV viewing, and the TV dominates the wall space. We painted the wall a dark gray so that the TV would blend into the wall more, and the bookshelves flanking the media stand have improved things tremendously. There was just one thing missing–art. We debated between a gallery wall, photo ledges, or shelves but ultimately decided a gallery wall was the way to go. After examining our collection of wall art and frames, we elected to go with a uniform grouping in a rectilinear arrangement around the TV, using the 12 x 12 square frames. For a couple of weeks, the frames sat empty (again), but the blankness in the well-used living room bothered me more than it had in the foyer, where no one really spends a lot of time. With no photos or photography of our own that was sized appropriately for these frames (yet), I pondered what to use instead. Inspiration hit when I realized (after how long?!) that scrapbook pages were the perfect fit for the frames! I took some pages leftover from one of those tear-out scrapbook page collections that were photography. I had mined its best contents years before but managed to scrounge enough decent pages to fill the frames. I played with the arrangement a bit until I was satisfied with the balance of color, pattern, texture, etc. Now our wall is much happier, and so are we. Plus, I realized that I can easily swap the contents for different scrapbook pages for seasonal or holiday themes as desired, and I won’t feel bad about ‘replacing’ someone’s picture. If you are looking for a relatively inexpensive and fast way to create some wall art, this is definitely an excellent option. This strategy would work well in rooms like kitchens and baths where you don’t want to use real photos or original artwork for fear of moisture damage but still want some bright and cheery art. I could also see this being useful for staging your home to sell when you need to depersonalize yet still have attractive (but affordable!) art to appeal to buyers or for furnishing a rental/income property with art. A key thing is to make sure the frames have nice mats, otherwise your photo scrapbook pages will look very much like scrapbook pages and less like real photos. The mats dress things up a bit, I think. PS: We don’t stage our bookshelves. Although the carefully planned arrangements of whatnots and collectibles tossed in with a few books harvested for their bindings (and not their contents) may be visually appealing, we use bookcases to do real work storing lots of books. 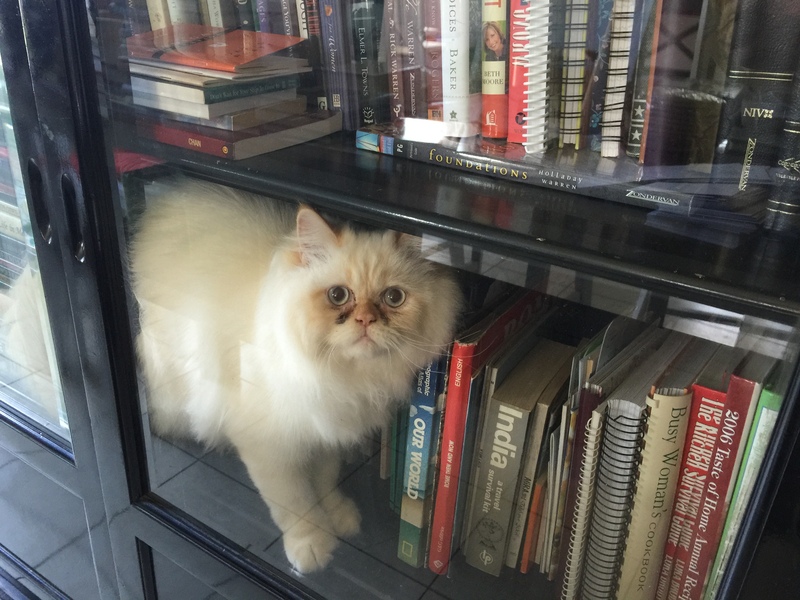 We are unapologetic bibliophiles, including the cats. Cats and books go well together. With a cup of tea. And perhaps a cozy quilt, too. Happy Friday!